Photographs serve many purposes, not least witnessing and memory. Here we have a photograph of a cotton field in the Mississippi Delta near the town of Money. But what is being witnessed or remembered? You probably have never heard of Money, Mississippi, but you probably have heard of Emmett Till. An African American born in Chicago, he visited relatives in Money at the age of fourteen during the summer of 1955. While there he allegedly “flirted” with a married woman—a white, married woman—in a local grocery store. And for that “crime” he was stripped, beaten and shot in the head, his face mutilated beyond all recognition, and his bodied tied to a cotton-gin fan and deposited in the Tallahatchie River. Till’s mother insisted on an open casket funeral and the now famous photograph of the disfigured Emmett Till appeared first in Jet magazine before being picked up by the mainstream media. The two perpetrators—Roy Bryant and J.W. Milam—were found “not-guilty” by an all white jury who deliberated for less than an hour in a segregated courthouse in nearby Sumner, Mississippi. One might imagine that a contemporary photographer seeking to memorialize the lynching of Emmett Till might photograph the dilapidated grocery store—or its historical marker—where Till violated the rigid codes of the Jim Crow South, or perhaps the spot on the river where Till’s body was eventually discovered. Or maybe even the Sumner, Mississippi courthouse. 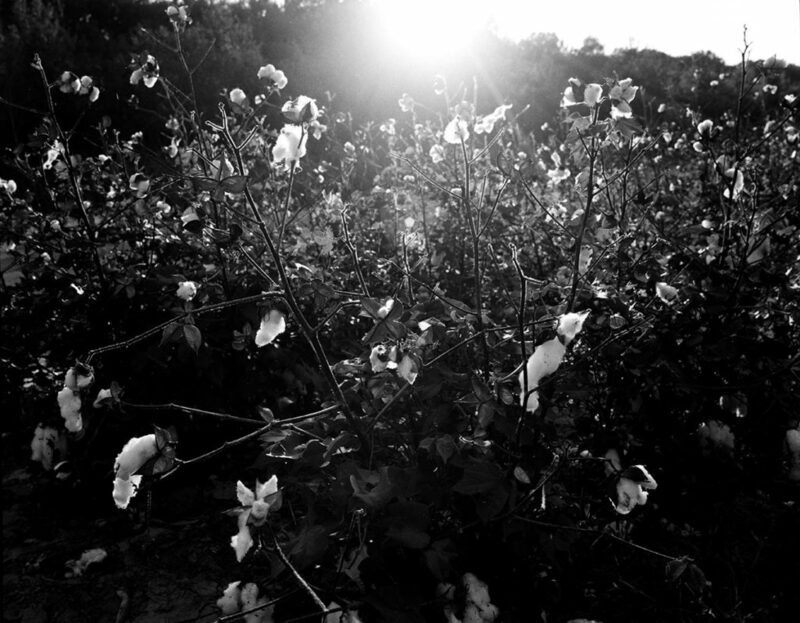 Instead, Andrew Lichtenstein chose to photograph a nearby cotton field. It is hard to know if the sun is rising or setting here, but whether you imagine that the camera is facing east or west there is no question that cotton is cast within a metaphorical timescape. The sun is either setting on cotton and hence a reminder that by the 1950s the economy that relied upon it was in full decline, or the sun is rising on it, and a reminder of the new day soon to be be ushered in by the nascent Civil Rights Movement. In either case, the photograph of a cotton field in Money, Mississippi is a poignant testament to the fact that while Bryant and Milam lynched Till and tied his body to a rusted cotton-gin fan, it was truly cotton—and the economic and social order that it animated—that killed him. We take lots of photographs these days. Photojournalists account for thousands every day and hundreds of thousands every year, but their output is dwarfed by the number of images taken by non-professional, most taken with a mobile device like a phone camera. 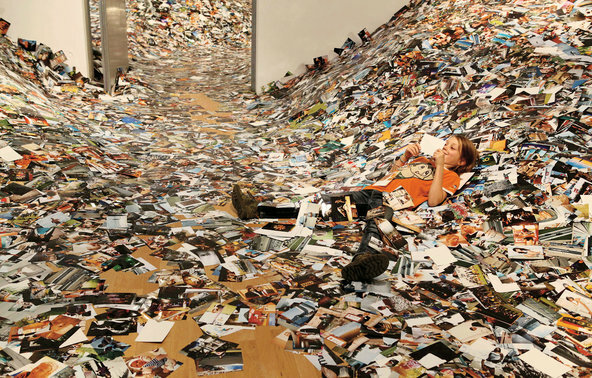 The photograph above shows a printout of the photographs uploaded on Flickr in a single 24 hour period in 2011 and the number of images taken in a given day surely exceeds what we see in this one photograph. In the most general sense the complaint is not new. The reliance on photographs will undermine our capacity for remembrance. This, of course, was Plato’s protest against writing (see his Phaedrus) and which has resurfaced over and again across the millennia with the development of each new technology of mediation and representation. And, of course, it is at the core of the iconoclastic critique of photography that we can trace in almost a direct line from Baudelaire to Susan Sontag. And, equally of course, it is wrong—or at least grossly simplistic. Yes, changing technologies alter the ways in which we practice and experience memory. The shift from orality to literacy is a case in point, but what was lost was not memory per se, but a particular way or register in which memory was practiced and understood. And the same could be said for every subsequent development of a new technology or medium of representation. 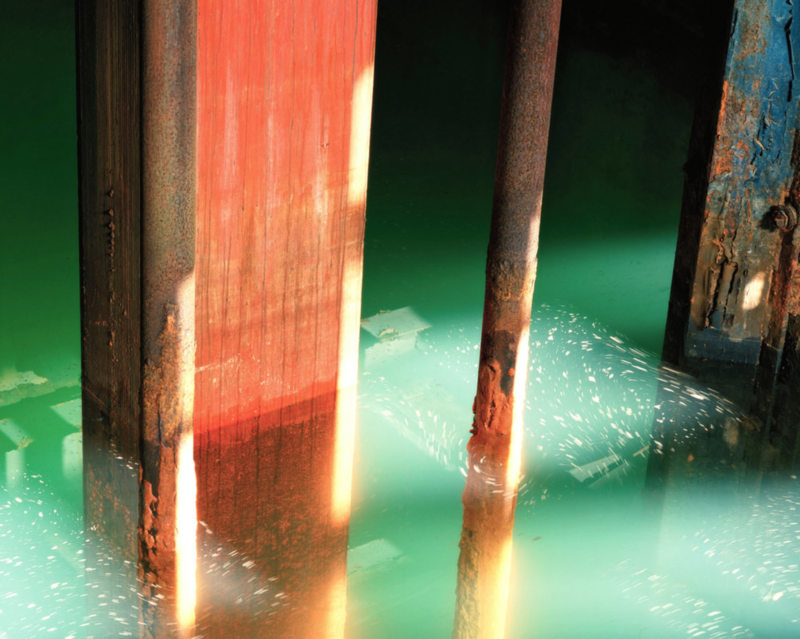 The bigger problem, however, is not that photography – digital or otherwise – has undermined our capacity for remembrance, but that the mindless repetition of this argument underwrites a critical discourse of photography that minimizes—if it doesn’t miss altogether—the power and capacity of the medium to help us think with and through such images as we encounter the problems and possibilities of modern life. And this is not least with respect to how the present—which in some measure is the only thing we can actually photography—functions to help us to (re)member the relationship between the past and the future in powerful and provocative ways. Consider, for example, this photograph published on the front page of the NYT—both print and on-line—on the same day as the above article lamenting the loss of remembrance animated by contemporary photographic practices. 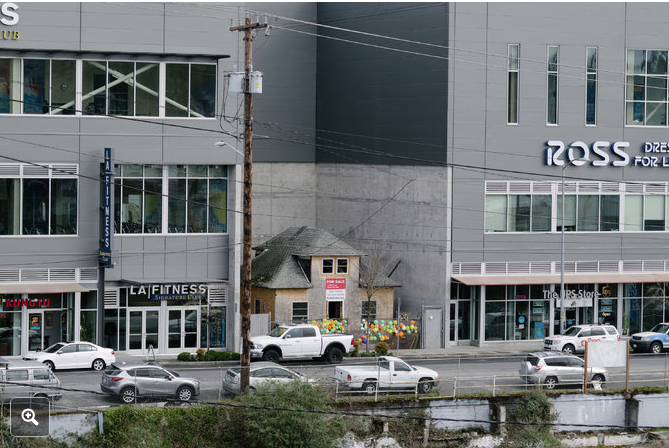 Captioned a “shrine to defiance,” the photograph shows a small bungalow in Seattle that seems to have stood in the way of progress. Hemmed in by high rise buildings that all but touch its outer walls, and otherwise bordered by a busy public thoroughfare, the house is altogether out of place—and out of time. It gestures to a past – one can imagine a row of such houses that once stood here – even as it points to the inevitable future that will soon be upon us as modernity move relentlessly forward. But it does so with an interesting edge. Notice that it is the bungalow that offers up the slightest hint of color—of individualism—in an otherwise and uniformly muted, almost black-and-white world. It will not survive for long, at least not in that space, but what the photograph testifies to is the fate of the unique individual in an increasingly modern society where progress refuses to stand still. But more, it also invites consideration of the tension between a more colorful past and a more uniform, colorless present, and to the tint and tone of the future that it portends. In short, this second photograph complicates our sense of what it means to remember and how we do it, and it does so in a powerful way. Not every photograph will do this, of course, but the potential is there and enough will achieve that potential that it is a profound error to repeat a tired argument about how the medium is a problem for remembrance without also emphasizing its powerful affordances otherwise. Our photographic practices have changed over the years—and there is every reason to believe that they will continue to do so in the years ahead; the more important point is that it is long past the time at which we should change the ways in which we talk photography as a cultural practice and phenomenon so as to understand it as the important mode of public art that it is in all of its forms. … the more things stay the same. Of all of the hundreds of photographs of the protests and violence and destruction to come out of Ferguson, MO in the past week it was this image that stung me the most. 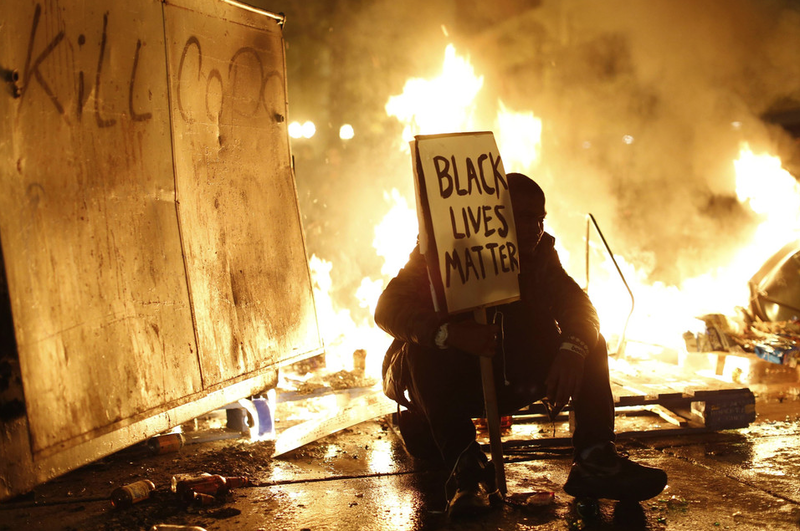 A lone black man squatting amidst a raging cauldron of hate and fear and frustration, he bears the simple message “Black Lives Matter.” The flames that surround him cast him in a shadow of backlight but illuminate both his sign and the graffiti behind him that implores whoever encounters it to “Kill Cops.” Each message is equally outrageous and absurd however meaningful it might be under the current circumstances. Of course black lives matter; that the claim even has to be made—and there is no question from this quarter that it does—is a national shame. To incite the killing of police—the avatars of preserving “the peace” and maintaining “order” —is a call to barbarism that beckons to a world governed by the Hobbesian “war of all against all.” In short, the photograph is an allegory for how tenuous the fabric of our contemporary society has become. What made the photograph most striking for me, however, was not the way in which it cautions us against the current tragedy of Ferguson, MO, but how it stands as a notice that the problem of black-white relations is the true American tragedy, a problem that never seems to go away, but recurs in cyclical fashion for every generation. And so I could not help but remember another photograph, equally absurd—and equally meaningful in its context—from my youth. 1968 seems so incredibly long ago—a lifetime for those in my generation—that it is hard to think of this photograph as anything but an aide memoire from the era of the civil rights movement. 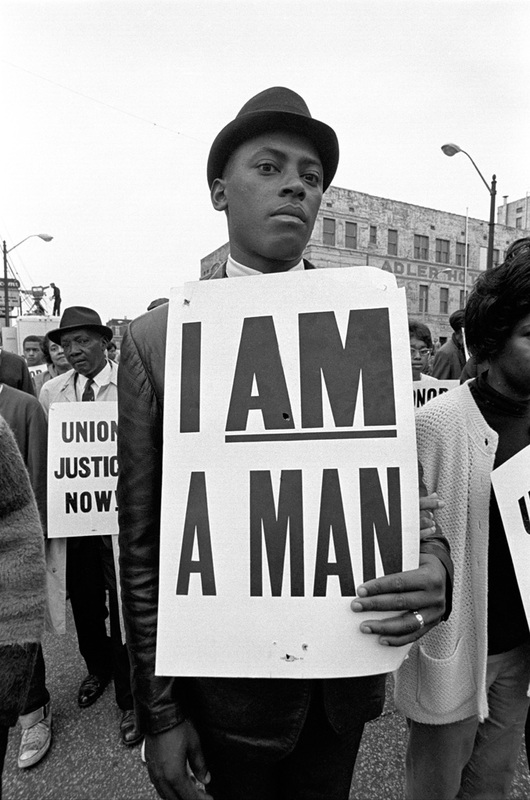 And yet for all the progress we presume to have made in the intervening decades, for all the talk of being in a “post-civil rights” era or a world of “hope,” there is no getting around the fact that the claim to manhood in the older photograph is a precursor to the precarity of black life marked in the contemporary photograph. Credit: Stephen Lam/Reuters; Bob Adelman/Corbis. Twenty five years ago it was all concrete and mortar and barbed wire dividing east from west. Guards with their dogs stood their posts and friend and families were separated from one another. And then, as if in a blink of an eye, the wall came down, leading some to maintain that history itself had come to an end. Of course, such pronouncements proved to be little more than precipitous as wars quickly transformed from being cold to hot once again. But, at least in Germany, perhaps the most stable and prosperous economy in the world right now, the Berlin Wall is but a distant memory. Photographic slide shows at numerous news outlets (e.g., here, here, and here) have featured the anniversary of this momentous event, comingling black & white images of the wall as a blockade separating a nation along military and ideological lines with black & white and color images of the frenzied destruction of the wall in 1989 and colored images of the current Germany where the least vestiges of what was once remain, mostly random slabs of concrete that once were covered with graffiti and now convey all manner of artistic murals. The transition from black & white to color, from then to now, is telling. But more so is the need to recover what once was if only to remember what had to be overcome. And, of course, public art plays an important part in such recovery. 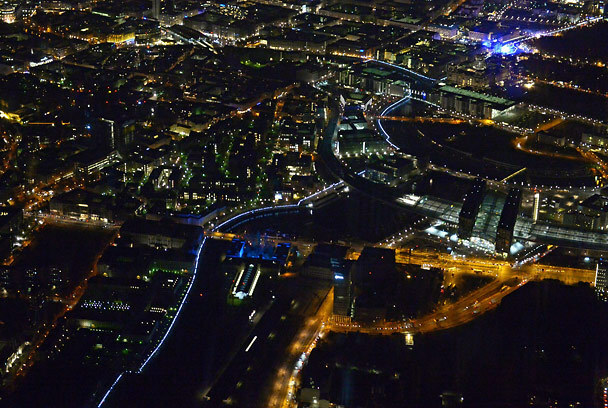 Public art takes many forms, of course, such a statuary and murals, as well as more transitory forms such as Lichtgrenze 2014, a temporary “light border” of 8,000 illuminated balloons that follows the path of the original Berlin Wall. But most of us, of course, will never be able to experience Lichtgrenze 2014, except of course through the photographic frame. The photograph above is not just a medium for conveying the art project however, but it is its own version of public art. After all, even those who can walk among the lights traversing the path of the wall cannot see it from the god’s eye view that the camera provides, reminding us of the capricious and haphazard trail that the wall followed. Note for example how difficult it is to identify the path of the light border among all the other lights. If you didn’t know what you were looking for you probably would assume that the bluish lights snaking through the city were little more than an ordinary thoroughfare with nothing distinguishing the lighted city on either side of the divide. And so the photograph invites a somewhat unique perspective on the ways in which walls often follow a somewhat arbitrary logic, and how, once they (inevitably) come down, it is easy to forget they were ever there in the first place. The fall of the Berlin Wall was a world historical event, to be sure, so much so that slabs of the wall have been cast to the four winds. 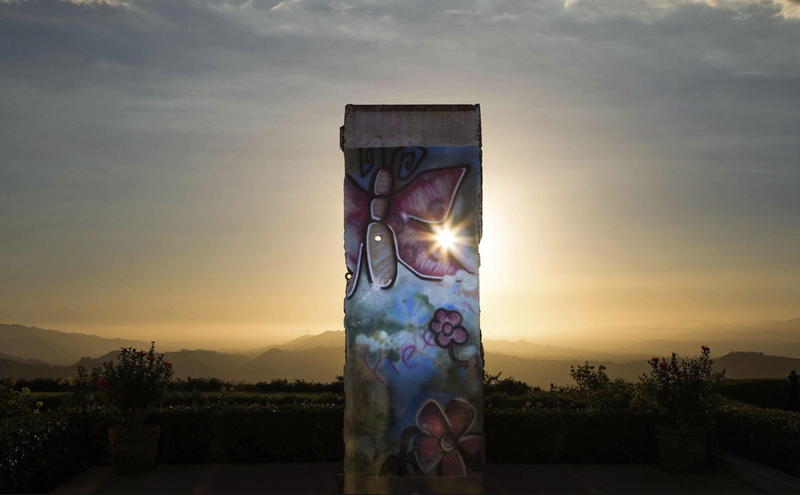 One can find them as scattered relics throughout the world in London, Brussels, Haifa, Kingston, Sofia, Moscow, Guatemala City, Porte de Versailles, Taipei, Tokyo, Seoul, Canberra, Cape Town, Buenos Aires, and any number of locations in the United States, including a city block that includes ten segments of the Wall in Los Angeles. And the message, it would seem, is clear enough: However much energy we put into building it and maintaining it, however much we think it can keep things in or keep things out, however much we think it will last forever … in the end it will fall, shards of it preserved as a reminder of the folly that produced it in the first place. idential Library where everyone is reminded that it was President Reagan who implored Mr. Gorbachev to “tear down that wall.” Simi Valley is also not all that far from where the wall designed to “secure” the border between the United States and Mexico begins its journey from the Pacific Ocean eastward. And so the photograph takes on something of an allegorical quality: mysteriously (ominously?) out of place in what appears to be a scene from the American western frontier, it is hard to know if the sun is setting on a past in which the wall came down, or if it rising on a new epoch of the inevitably failed project of building walls for political purposes. Two lovers caught in a passionate embrace. He on the left, she on the right. Their faces barely recognizable as their bodies meld into one another. Oblivious to all that surrounds them, it is a tender, private, intimate moment in a public space. At first blush it could be two individuals (once again) performing the now famous Times Square Kiss in a modern setting. But look again. The differences are both subtle and profound. Neither is wearing a recognizable uniform. She is actively engaged in the kiss, her arms pulling him towards her as much as (if indeed not more than) he is pulling her towards him. Notice for example how his right arm seems barely to be holding her while her arms reach fully around him, holding him in place. More interesting still is the fact that she is holding a slab of concrete in one hand, her finger nails giving the impression of being freshly manicured. If the sign of the kiss in the original photograph was animated by an aggressive, masculine representation of state military power, here the kiss is no less a sign of aggression—it is hard to imagine that the concrete slab would be used as anything other than a weapon, particularly given that the caption tells us that this is taken at the site of a protest—but it is now no longer institutionalized by the state and it is gendered feminine. Last, and perhaps most important, while the kissers are plainly and visibly in a public space, there are no onlookers who can channel a public attitude about what is going on. Indeed, there is a clear sense of voyeurism here as we, the viewers, seem to be intruding on an altogether private moment. So what are we to make of this photograph? The caption identifies the kissers as protestors in Caracas, Venezuela, the site of prolonged and massive public protests against rampant crime, protracted food shortages, and an altogether ineffective and authoritarian government. The government crackdown against such protests has resulted in nearly forty deaths and hundreds of injuries, leading to demands for investigation by the Organization of American States (OAS). That too has produced its own manner of controversy as the OAS leadership challenged the legitimacy of opposition leader Maria Corina Machado to address the body. When she was finally allowed to speak, the sessions were held behind closed doors; one member of the OAS noted that the meetings would be conducted “With total transparency: In privacy.” The photograph above seems to mock this “war is peace, slavery is freedom” logic as it failingly purports to perform intimacy in a public space under the broken veil of privacy. There may be no viewing public observable to legitimize the union, but then of course there is the camera and our own spectatorial gaze which gives the lie to the whole process. Transparency in private is at best a comfortable fiction and at worst an intentional deception. There is an additional dimension to the photograph that bears attention, and it has relatively little to do per se with the economic and political turmoil in Venezuela. Instead, it concerns how we understand Alfred Eisenstadt’s Times Square Kiss and all it stands for in our cultural memory. The original kiss photograph took place on the occasion of VJ Day and the end of World War II. It is often remarked as illustrating the return to normalcy. But its contrast with the image above helps to reveal how constructed the conventions of such normalcy can be: men kissing women, women being kissed; the legitimation of violence as a manifestation of masculine, state governed military institutions; the forced separation of Eros and Thanatos; the performance of intimacy in public, and so on. All such constructions—or should we call them “comfortable fictions”— indicate a particular worldview, to be sure, and perhaps even one that we might want to endorse, but the point is that it is particular, not universal. Each photograph shows “a” truth, or many such truths, but certainly not “the” truth, however objective the photographic representation of the event on hand might be. As the song says, a kiss is just a kiss … or is it? 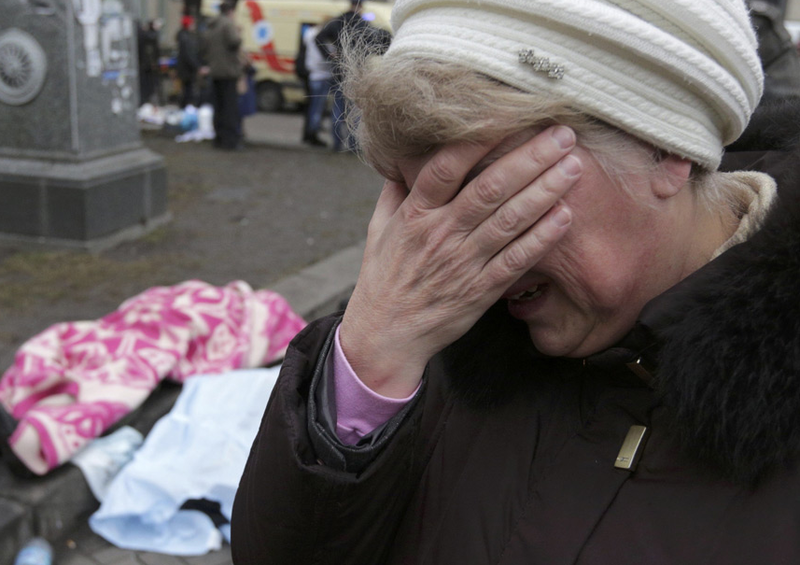 The Battle for Kiev is over, at least for now. The President has been duly ousted by the Parliament, Independence Square is slowly being cleared of the barricades, and shrines to the dead are beginning to appear. How many dead is hard to know, but numbers range from 70 to more than 100, with at least 500+ serious injuries on top of that number—and that is just among the protestors of the Yanukovich administration, there were deaths and injuries amongst government police as well. Photographs of blood stained streets and shrouded dead bodies are prominent, made all the more distressing by virtue of the fact that much of the violence was perpetrated by the police against the citizens of a democratic society who, presumably, it was their job to protect. Before we get too sanctimonious, however, we should recall that this is not the first time that democratic governments have turned their power and force tyrannically against their own citizenry, and with disastrous results. 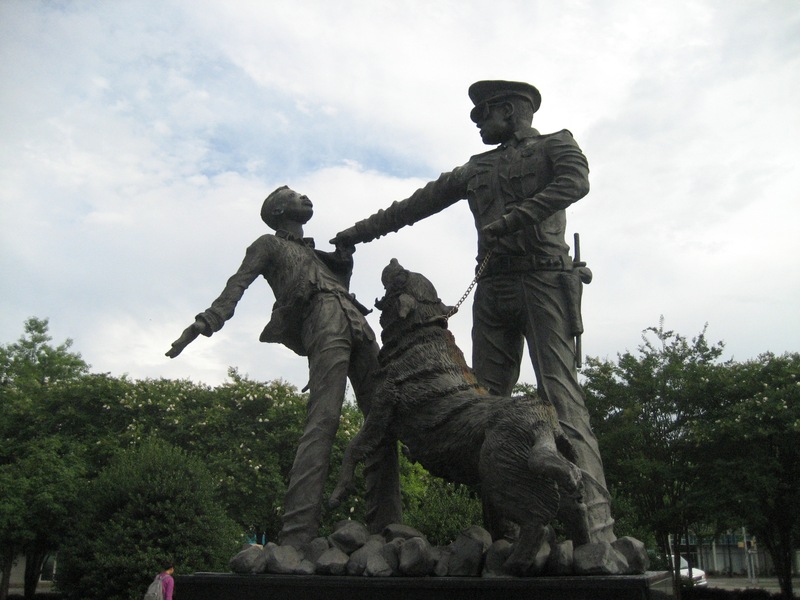 One need only recall the use of guard dogs and water cannon in attacks against nonviolent civil rights protestors in Birmingham, Alabama or the deaths of four students at the Kent State Massacre when student anti-war protestors were fired upon by the Ohio National Guard. In many ways, the photograph above recalls the famous photograph of a young woman wailing in anger, pain, and grief in the in the midst of the Kent State killings. But, of course, there are important differences. In the Kent State photograph the woman is not only younger, but she is prominently situated at the middle of a public scene that recalls much of the action going on around her, and her expression is cast outward to others, as much a plea for help—or an expression of public outrage—as anything. Here the photograph is closely cropped so that the woman fills the frame and her grief seems more inward, more personal than public. Indeed, pain and grief seem to be the conspicuous emotions being invoked, not anger or outrage. And more, she doesn’t seem to be calling out to anyone so much as absorbing and containing the pain within herself. Notice how she covers her face in this regard, blocking out the scene that she cannot bring herself to witness. And there is another difference as well. The dead bodies that lie on the ground behind her are covered, barely recognizable as such; indeed, without being alerted by the caption one might fail to see them altogether. Contrast the veiling of bodies and emotions with the photograph of the Kent State Massacre where the young woman kneels next to the prostate body that lies prominent in front of her—and in front of us, always and forever an image of the costs and effects of a democracy turned tyrannous. be as it indicates respect for the deceased and saves their families and friends from having to live forever with horrific images of their loved ones. And yet, there is a cost here too, as it reifies the dead body, transforming it into an anonymous, collective entity that inadvertently denies all sense of personal identity and individual loss. 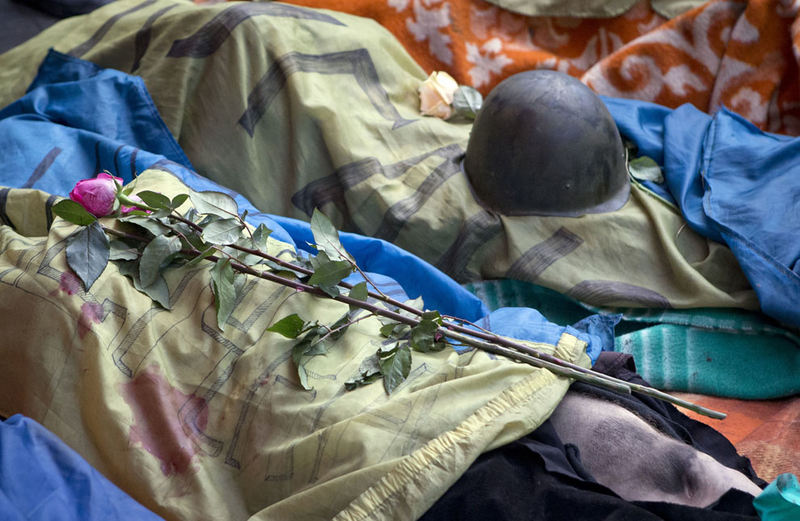 The image above is especially telling in this regard as the flag that drapes the bodies combines with the helmet and flower to ritualize the deaths that are both signified and memorialized, revealing them as part of a national cause fought in the name of democracy—as they were—but at the same time veiling or erasing (or at the very least mitigating) the outrage that led to their individual sacrifice by covering the bodies. There is perhaps no truly good way to represent such a situation, but that does not mean that we should ignore the implications of the choices of representation that we take, however conventional they might be. The protestors who died in Independence Square were heroes, to be sure, but they were also individual citizens shot down and butchered by the very forces that should have been protecting them. And that is not something that should ever get lost in the telling of—or seeing—the Battle of Kiev. Marting Luther King Day is a national “day on, not a day off,” a day of service, a day to give back to our communities. And we should all honor that sentiment. But we must never forget what it was that Dr. King faced and was fighting so selflessly and vociferously against, or what his struggles forced us to see, and in seeing to revile and resist. We live in an age of Photoshop, where the even the slightest adjustment to a photograph can call forth charges of dishonesty and all sorts of teeth gnashing and acrimony. And at the same time, as this photograph suggests, there is a part of us that appreciates the power of the art of photography to remake the world the way we want it to be, even if it is something of a fantasy and we know it. 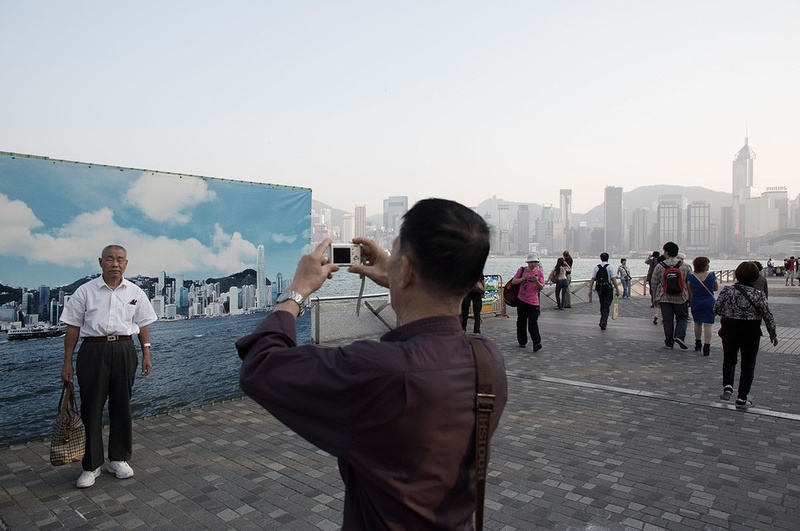 You wait your whole life to visit Hong Kong and you want a picture for the family photo album to prove that you were there that is worthy of the effort, one with blue skies and puffy cumulous clouds, not a haze filled skyline that casts a scrim like veil over the city that casts everything in grey scales. And what is wrong with that anyway? The photograph above does not answer this question, but it does help to identify the problem that it poses. As we frequently note at NCN, one of the chief things that photographs do is to put the habits of social and civic life on display for reflection; and because these are habits of everyday life we tend to see them literally as normal, more or less natural and, as a result, altogether unremarkable features of an image. So it is that one might focus on the man taking the photograph and see nothing that is particularly noteworthy, as do most of the other people in the image who pass by without so much as a notice. And the reason for this would be patent, for what we are seeing is precisely the habit of casting and controlling our memories for posterity, and in particular how natural it seems to be—indeed, I suspect that many of us can imagine ourselves doing something similar given comparable circumstances—even as it stands in stark contrast to what we know the truth of the matter to be. And there, I believe, is the rub, for what the photograph above also features is the contrast between the memory we produce that exists within the frame of the image that is preserved for posterity—here the photograph we see being taken that we can only imagine in all of its bright colors—and what occurs outside of that frame in the haze-tinted smog of the real Hong Kong. It would be easy, of course, for us to assume that such a problem applies only to snapshot photography and the conventions of crafting and preserving family photo albums where the primary goal is the production of a nostalgic and happy memory for subsequent generations. But that would be an error, for every photograph, amateur or professional, analog or digital, black and white or in living color are subject to the same constraints. That does not mean that we should reject the “truth” of the image, but it does mean that we should recognize that the truths that we see are always partial and that the meaning of any image is subject to change as we extend the dimensions of the frame we are enabled to see. This is something we all know. In its own way it points to an attitude that is something of a habit of modern life. And in that context the virtue of this photograph is how it puts this habit on display as both a reminder and a site of reflection concerning its importance. I had forgotten about all of this until it came back in a rush of memories after stumbling across the above photograph, part of Joseph Powell’s “Looking into the Past” project. It is a testament, of course, to the function of photographs as aide memoire, but there is something else going on with this image as well. Powell’s photograph relies on a visual trope we might call “then and now” as it calls attention to temporal differences and in my case the photograph not only invoked a racist tinged, nostalgic trip down memory’s lane, but it also made me think about how different (and similar) I am now from who I was in 1963. More important than my personal memories, of course, is how we as a “people” remember and experience the relationship between now and then; after all, the photograph features the Mall in Washington, D.C., and if there is a visual marker for a national meeting place this surely has a pretty strong claim on it. The most obvious tension in the photograph comes from the difference between black and white (then) and, so called, “living color (now). But perhaps a more subtle and important tension is animated by the relationship of the container (the present) and the thing contained (the past). Differences in color tell us that one is past and the other more recent, but it doesn’t tell us how to read that relationship; locating the former picture within the frame of the later, however, suggests movement. And more, it implies that the past should be read through the lens of the present. To get the point, imagine the photograph as if the images were reversed, and the present was located within the larger landscape of the past. Metaphors are important, and the key question here is not just what do we see when we look to the past through the lens of the present, but what does the lens invite or enable us to see in the present—or as with any optic, what does it restrict from vision? In this photograph the black and white past (which references a society divided into black and white) is miniaturized by the expansive magnification of the landscape of a multicolored present (which references a multicolored society). The implication is a somewhat liberal narrative of racial and national progress, perhaps even gesturing to that world where, in Dr. King’s terms, one is measured by the “content of their character” and not “the color of their skin.” But there is more, for then race relations were the occasion of a national “moral crisis” and those populating the Mall were citizens demanding justice; but notice that in the contemporary, multicolored landscape there is not even the hint of political activity as the active citizens in the earlier photograph morph into passive and leisurely tourists. Perhaps that is the world that Dr. King had in mind when he imagined his version of the American dream, but somehow I doubt it. What is to be made of all of this? That, of course, is where things get tricky, for the past is not necessarily a prelude to the present (or for that matter the future), nor is the present the only lens through which to imagine the past. 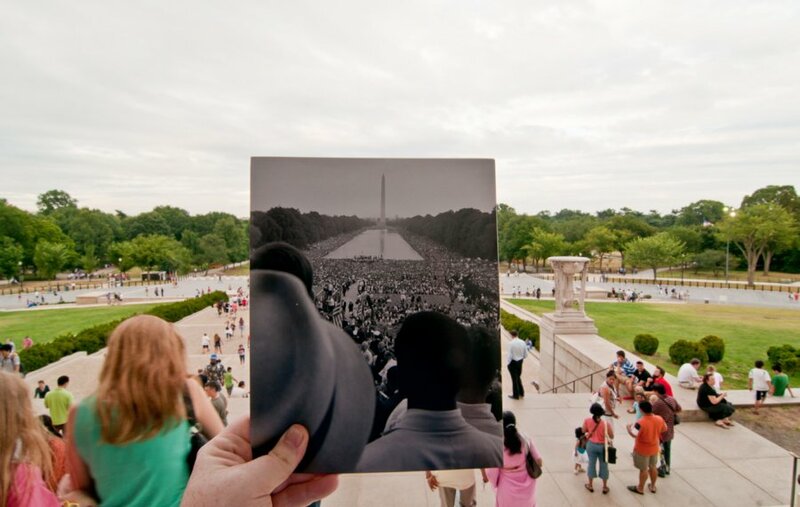 As we celebrate the fiftieth anniversary of the March on Washington there is an impulse to read the relationship between then and now as one of racial progress that remembers the past all too simply in terms of the present. And that is a compelling narrative that has some merit, even as we acknowledge that we have miles to go before we might achieve anything like a truly post-racial, egalitarian future. But reversing the lens reminds us that any progress that was made was hard fought, achieved by the blood and sweat of the active citizens willing to take on significant individual and collective risk to serve a public good. It asks us to consider the difference between then and now in terms of a much wider array of factors and outcomes. And when we see the photograph this way it has to give us pause to wonder if the public that represented such important civic activity then has now gone into eclipse. It is only a question, but it is one we ignore at some peril.